EDSA, named after Epifanio delos Santos, is Metro Manila's main thoroughfare stretching around 24 kilomters from Caloocan City in the north, to Pasay City down south. This is just a quick post on the real story behind Highway 54, the old name of the historic avenue known today as EDSA. Named after Epifanio de los Santos: a historian, jurist, artist, literary critic, and scholar from Malabon. Construction started in the 1930s under Pres. Manual L. Quezon and initially called North-South Circumferential Road. Renamed Highway 54 in the 1950s. Renamed Epifanio de los Santos Avenue (EDSA) on April 7, 1959 by virtue of Republic Act No. 2140. 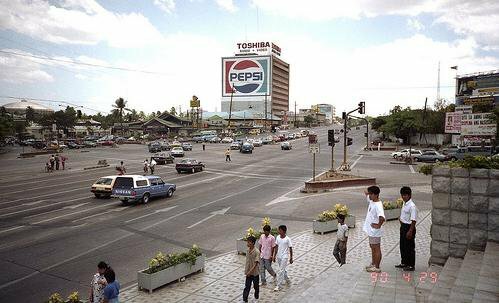 Picture of EDSA corner Ortigas Avenue from EDSA Shrine, no MRT yet, in 1990. Photo Credits to unknown photographer. Why was EDSA formerly called Highway 54? Some people say it's because EDSA is 54 kilometers to which no truth to the claim (or probably the government indicated 54 kilometers on the contract price but actually built 24 kilometers, pocketed the cost of the 20 kilometers (missing miles) :) while some say because there were 53 other roads constructed before it. However this one came out in the comments section which has some truth in it: "The road was named Highway 54 to pay tribute to the men that built it - the 54th Army Engineering Brigade led by engineers Florencio Moreno and Osmundo Monsod. It was completed in 1940 (not in 1954) under the presidency of Pres. Manuel L. Quezon." Highway 54 is also a commercial building in front of SM Megamall in Mandaluyong, the home of Hway Cafe, St. Augustine School of Nursing and other establishments. How long is EDSA in kilometers? How about the planned second level EDSA Skyway? It's a planned second level on top of the old EDSA being studied by the Department of Public Works and Highways (DPWH) for 2012 budget. Either a second level road or a SMART tunnel to double as a flood water collector. Just what EDSA needs as road widening is impractical. Proposed start of construction is next year but will be finished far beyond president Aquino's term. Are there alternative route to EDSA going from QC to Makati? C5 is one but for me, I take Araneta Avenue, N. DOmingo, Blumentritt then the inner circuitous roads of San Juan going to Maysilo, Mandaluyong, to Makati Avenue. to Monitor EDSA traffic, here's a live traffic monitoring system by the Metropolitan manila Development Agency (MMDA). Tutubi uses it for months now and quite accurate. Interesting post, especially for someone like me that drives on edsa almost everyday. interesting.. I remember we called it hiway 54 way back then but didn't know why. i wonder how many days was edsa completed? if i heard him right, one of my history professors in college told us that it was called as such because it was built in 54 days. the challenge now is finding the source/s that back this up. Arch. Felino Palafox may have been taking you for a ride. EDSA cannot be 54 meters wide. It is a 10-lane divided highway (5 lanes each side). A standard highway lane is about 3.7 meters wide. You do the math and add the space in between the lanes and you won't get near 54 meters. The road was named Highway 54 to pay tribute to the men that built it - the 54th Army Engineering Brigade led by engineers Florencio Moreno and Osmundo Monsod. It was completed in 1940 (not in 1954) under the presidency of Pres. Manuel L. Quezon. Marinduque (Heart of the Philippines) not included at Philippine Provinces? I rather believed that the Highway 54 was built by the American soldiers in 1954. You may ask why some of the major roads near EDSA were named after the Americans (Dewey Blvd.-now Roxas Blvd., McArthur Highway, Harrison Blvd.-now Quirino Highway, Nichols Road - now Airport or NAIA Road). It was with the initiation of the American soldiers that these roads were built. But they don't have American name for North and South Diversion Road and the Highway 54. That's why they just named them just like that. If the Filipinos were the ones who built the "highway", they would not name it as Highway 54 but something more a Spanish-like sound like with word "Calle" or named after a Filipino. But after 5 years, they did it for Epifanio in 1959. Remember, we were still under Spanish mentality that time so it's impossible to name it as Highway 54 to pay tribute to the 54th Army Engg. Brigade. Also, it the Americans were the ones who built the "highway", they will not name it for the 54th Army Engg. Brigade as they want to leave a legacy behind in our country. Most probably, the 54th Army Engg. Brigade had built a single lane road (now called EDSA) in 1940 and named it as "Junio 19" but it was the Americans who made it wider and connecting North and South Diversions (now NLEX & SLEX) to become a highway and named it as Highway 54.